Despite the practical necessity of trilateral security cooperation among the United States, the Republic of Korea (ROK), and Japan, conditioned by changes in the security environment in and around the Korean Peninsula, the Park administration has maintained a kind of lukewarm or cautious attitude toward it. Several factors have contributed to South Korea’s position on it. They can be categorized into two groups: Korea-Japan relations and China factors. However, the agreement on the “comfort women” on December 28, 2015, the fourth nuclear test of North Korea on January 6, 2016,1 and disappointing Chinese behavior after the test have provided a new, maybe the most favorable, atmosphere for the realization of trilateral security cooperation. The ROK should consider this cooperation option very seriously. From the beginning of the Park administration, the Korea-Japan relationship continuously deteriorated. Almost nothing could be done between the two countries until the “comfort women” issue was resolved. In the eyes of most South Koreans, Prime Minister Abe and his administration were seen as some kind of historical revisionists. There were four, principal unresolved and recurring issues between the ROK and Japan: Dokdo Island, history textbooks, the Yasukuni Shrine, and “comfort women.”2 Among them, President Park placed the utmost importance on the resolution of “comfort women” issue in South Korea’s relations with Japan. Despite all concerns and criticism, she maintained this tough position as a total of 12 director-general level meetings took place. The prospects for a resolution were not that good. Against general expectations on both sides, the ROK and Japan suddenly reached an agreement on the “comfort women” issue at the end of 2015. While there is criticism against it,3 the Park administration appears to be quite firm in sticking with it. The agreement is a very meaningful and important turning point in South Korean-Japanese relations since it has created the background for talking about, agreeing on, and addressing long overdue issues of cooperation between the two countries, including security issues. Furthermore, this can be translated into trilateral ROK-US-Japan security cooperation. The second factor that might contribute to the realization of trilateral security cooperation is North Korea’s fourth nuclear test and, more importantly, the Chinese reaction to it. Whatever the reasons for it, the test has once again proved that North Korea is determined to keep and advance its nuclear capabilities under any circumstance. It is posing an increasing threat to South Korea and Japan, directly and immediately, which means that they have more common concerns and that they should recognize the need to find ways to have more reliable and effective deterrent measures against the ever-increasing nuclear and missile threats. Since South Korea and Japan rely on US extended deterrence for their own security, they are interlinked, one way or another. It can be said that North Korea’s fourth test has made it natural and necessary for South Korea to revisit the trilateral security cooperation as a way to enhance the credibility of the US extended deterrence vis-?-vis South Korea. In addition, Chinese reactions following North Korea’s nuclear test have made South Korea reconsider its hopes for China’s cooperation in solving the North Korean nuclear problem, which it has underscored in its diplomacy for solving the problem over the years. Chinese reactions after this test have been particularly disappointing. Foreign Minister Wang Yi merely reiterated China’s traditional three principles: denuclearization, peace and stability, and negotiations. In the eyes of most South Koreans, China appears to be primarily concerned with regime stability in North Korea, prioritizing that over denuclearization, and China is not much concerned with South Korea’s own security interests. Now Park’s China policy is the target of criticism from both progressives and conservatives for the failure in securing long-expected Chinese cooperation when North Korean put this to a test and for the overall misunderstanding of China’s policy toward the Korean Peninsula. In recognition of this misjudgment, the South Korean government must now review and adjust its China policy. For economic reasons as well as North Korean issues, the South Korean government has been very cautious not to provoke China. This has been seen in its reluctance to advance trilateral security cooperation and on the Terminal High Altitude Area Defense (THAAD) issue, but the future may be different.4 The South Korean government could and should do whatever is necessary to safeguard its national security interests. The general situation and mood are now much more positive for trilateral security cooperation, but there are several points to be considered in realizing it. First of all, trilateral security cooperation should be pushed by South Korea. If it is pushed by the United States and Japan, it would be met with strong resistance since China believes such cooperation is a formula to contain China by forming a tight virtual, maybe even a formal, alliance between the United States and its allies. In addition, such cooperation being pushed by the United States and/or Japan could be met with strong domestic resistance in South Korea, especially from those who argue that trilateral security cooperation would bring the Cold War structure or confrontation back to the Korean Peninsula and Northeast Asia and would serve the interests of the United States and Japan, not those of South Korea. Secondly, some are likely to argue that under the trilateral security cooperation framework, South Korea will have little room to pursue its own policy initiatives toward North Korea. Korean Peninsula issues will become secondary, entrapped in a larger regional context; “fear of entrapment” may arise. To avoid or minimize Chinese and domestic resistance towards this cooperation, South Korea should take a leading role or at least exercise convening power in realizing the trilateral security cooperation. The timing and atmosphere are now just right, but the window of opportunity may soon close again, and it is unpredictable when it might reopen. Trilateral security cooperation should be mainly focused on North Korean issues and unification. The important issues to be discussed and resolved by all three parties range from the nuclear issue to human rights. Instead of focusing on one or two burning issues such as the General Security of Military Information Agreement (GSOMIA), the Acquisition and Cross-servicing Agreement (ACSA), and missile defense, the three parties should start with talks over a blueprint and road map (or action plan) for unification and then the regional strategic architecture conducive to achieving it, if possible. South Korea is suspicious of Japan’s position on Korean unification. Many believe Japan wants the continuation of a divided Korea. At the same time, Japan may be suspicious of a future unified Korea’s orientation, suspecting that it would draw much closer to China. After all, recently many Japanese and even some Americans have argued that South Korea has tilted toward China. Unless we have trust and confidence in each other, trilateral security cooperation will lack a strategic rationale and could be stalled again and again. That is why talks over the blueprint and action plan are necessary; they will contribute to the enhancement of mutual trust and confidence in each other’s intentions. In other words, the cognitive foundation of trilateral security cooperation can be established if there is a common vision for the future of Korean Peninsula, making it easier to solve more technical issues of cooperation. For this purpose, it is necessary to revive the Trilateral Coordination and Oversight Group (TCOG) and come up with a common approach toward North Korean issues and unification. Not only a linear path but also a non-linear path (i.e., instability and contingencies) must be on the agenda. To facilitate government efforts and to secure the understanding and support of the public, it would be helpful to have expert group meetings, but they must not be totally independent from the government work. Rather, they must be linked with government work indirectly. For that, it may be desirable to introduce the Trilateral experts and eminent persons (EEP) formula. While we focus primarily on the Korean Peninsula, we must investigate ways to go beyond this geographical scope for trilateral security cooperation. Whenever the three countries try to define the regional range of trilateral security cooperation, they are usually faced with foreign (mostly Chinese) resistance and domestic resistance in Korea. It is neither necessary nor desirable for the three to clearly define the missions of trilateral security cooperation in a geographical context. Rather, we can concentrate on functional, issue-based cooperation among the three countries. There are many important non-traditional human security issues that affect peace and stability at all levels: cyber security, pandemics and public health, nuclear safety and security (plus safeguards), humanitarian assistance and disaster relief (HADR), anti-piracy (and the security of source lines of code (SLOC)), search and rescue (S&R) operations, anti-terrorism, cooperation against drugs and human trafficking, the fight against organized crime, and etc. These are all related to the global and regional commons. If trilateral security cooperation were geared toward the provision of public goods to the international community, it would be easier to overcome foreign and domestic resistance. This would also enhance mutual understanding among those are involved. The three could help developing countries in nation building. Working together on official development assistance (ODA) programs would enhance the efficacy of those programs by making them mutually complementary and avoiding duplication. In addition to the functional issue-based approach, it is necessary to think of ways to preserve and advance a rule-based international order. The three countries share the same values such as freedom, democracy, human rights, and a market economy. Joint efforts in defining, protecting, and adjusting the rules and norms, as well as the process for the realization of those values, must be sought. Whenever and wherever challenges to the existing rule-based international order take place, as a country that has benefited from the rule-based, liberal international order, South Korea, not only along with the United States and Japan but also with other like-minded countries, should be forthcoming in protecting it. The reason why this is important is that it is about South Korea’s identity and integrity as a democratic country and a responsible member of the international community. Furthermore, this would enable South Korea to build a network of cooperation well beyond Northeast Asia and contribute to the realization of its desire to be at the center of world politics. Trilateral security cooperation centered on a rule-based international order is a vehicle, or catalyst, for attaining such goals. Trilateral security cooperation among South Korea, the United States and Japan is an overdue objective. The resolution of the “comfort women” issue and the fourth nuclear test of North Korea have opened a window of opportunity for its realization, but the window of opportunity may not remain open for long. Thus, South Korea should not waste time. Rather it should seize this rare opportunity as fast as it can. Of course, there will be costs South Korea would have to bear, but the benefits would be much greater. 1.North Korea claimed it was a hydrogen, not an atomic, bomb test, but outside experts have assessed that this is not true. The bomb test may have been a boosted fission kind, which contains some element of hydrogen. 2.There are other issues, such as forced labor, the voting rights of Koreans living in Japan, hate speech, and the trade imbalance, but these four were identified as the core issues to be resolved by President Roh Moo-hyun. 3.The ROK side demanded four things: recognition of the Japanese government’s involvement in recruiting and running the comfort women system, self-reflection, an apology, and compensation. All four elements seem to be included in the agreement. But many NGOs such as Jungdaehyeop (Association for the Comfort Women Issue) criticized the fact that the agreement does not clearly recognize the Japanese state’s responsibility. 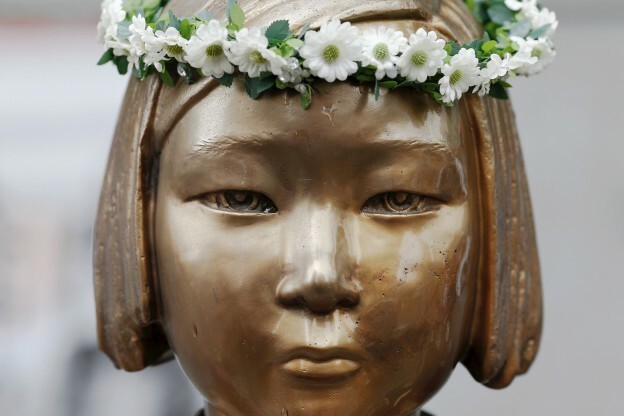 Another criticism is that the agreement includes the removal of the “girl of peace statue,” which is currently located in front of the Japanese embassy in Seoul. 4.Park has already hinted at the possibility of a different approach in her press conference on January 13. On the THAAD issue, she said that, depending on the situation and the national interest, this issue would be approached anew. “Despite the practical necessity of trilateral security cooperation among the United States, the Republic of Korea (ROK), and Japan, conditioned by changes in the security environment in and around the Korean Peninsula”. Yes. Japan and the ROK are obviously expecting a DPRK invasion or attack. When are we going to start acknowledging that such ‘cooperation’ is between puppets and their master? Both the DPRK and Japan are occupied vassals. Quoting them is as funny as quoting your own dummy. They’re our dummies, for now. The DPRK is not our dummy. It’s an independent state and it acts independently. Why does it make these over-the-top gestures and statements? Who (hint: it’s not us) is its audience for those gestures and statements? Kim’s statements are addresses to the hearts and minds of his Southern brethren, who enjoy watching their occupier’s military getting the finger from their Northern cousins. Some things never change and the sense of Korean identity is one of them. It’s politics and, like all politics, it’s local.